Sister Ships Gulf Farmer, Gulf Banker, Gulf Merchant and Gulf Trader. 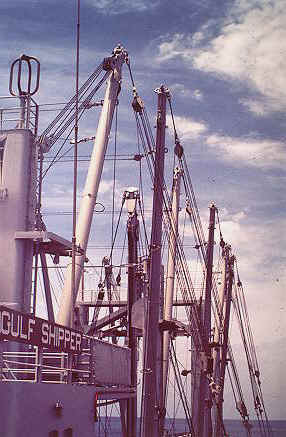 The Gulf Shipper was my first permanent job. I joined her in December of 1972. She carried a total of 12 passengers. Our voyages to S & E Africa lasted between 3 1/2 and 4 1/2 months. Trips to the west coast of South America ranged from 2-3 months. The ship normally loaded in the ports of New Orleans, Baton Rouge, Mobile, Pascagoula , Gulfport MS, Pensacola, Corpus Christi, Beaumont TX, Houston, TX Lake Charles, La. Ports visited were Santa Marta, Barranquilla, Buenaventura and Cartagena in Colombia, Manta and Guayaquil in Ecuador, Colon and Balboa in Panama, Talara, Pisco, Huacho, Huarmey, Callao, Ilo in Peru, Antofagasta, Arica, Talcahuano, and Valparaiso in Chile. Africa: Walvis Bay, Capetown, Durban, East London, Port Elizabeth, Lorenco Marques (Maputo), Beira, in Mozambique, Tanga and Dar es Salaam in Tanzania, and Mombasa, Kenya. While I was assigned to the Gulf Shipper one of the most exciting events occured in my 23 years in the Merchant Marine. In the 70's the ports in South and East Africa were very congested. One year we arrived in Durban RSA just before Christmas and found that we would not be going alongside a dock for several weeks and that we had to anchor outside the harbor. After several days of " swinging on the hook", we got an urgent call from the ship's agent in Durban. The Radio Officer on the Mayo Lykes had been injured and they asked if I would volunteer to fly up to Beira, Mozambique and act as Radio Officer until another could be flown out from the USA. I jumped at the chance. It would be quite an adventure and certainly more fun than the idleness of being anchored off of Durban for the holidays. 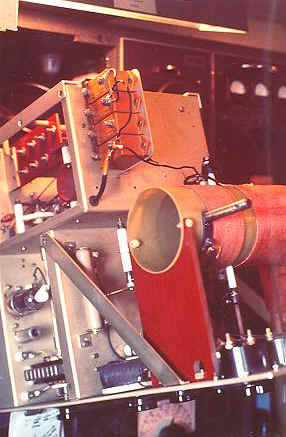 Above top: 410-524 Khz emergency transmitter view.